Make some space next to your Past and Prologue; move over your copy of Through the Years. 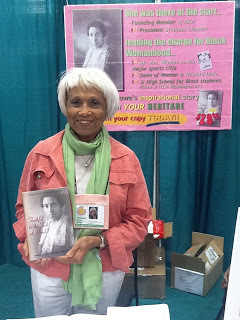 For, another important history book chronicling an Alpha Kappa Alpha Sorority, Inc founder has been published – Faithful To the Task at Hand: The Life of Lucy Diggs Slowe. For those who were unable to make #AKABoule2012 here is another chance to speak with the author and get your copy of the novel. Author Dr. Anne Pruitt-Logan is scheduled to sign copies at the alumni book fair at the Howard University Bookstore on Saturday, October 20, 2012, from 2-4 p.m. The book tells the story of Lucy Diggs Slowe, a pioneering African American figure in sports and education. Born twenty years after the end of slavery, Slowe became a seventeen-time tennis champion and the first African American woman to win a major sports title. She was also one of the founders of Alpha Kappa Alpha Sorority, Inc., and the first Dean of Women at Howard University. Pruitt-Logan is the third author that attempted to record the life of AKA Founder, Lucy Diggs Slowe. Though the book was finally published in June of 2012, reports say that this accomplishment wasn’t easy. Pruitt-Logan originally worked on the project for a friend and completed the book in her honor. The project took 8 long years. Faithful To the Task at Hand: The Life of Lucy Diggs Slowe is available thru SUNY Press and Amazon. The event shall occur during 2012 homecoming festivities at Howard University. This book signing is definitely one NOT TO MISS. Will you be attending homecoming festivities at Howard this year?